i b i k e l o n d o n: Are you ready to cycle through winter? Are you ready to cycle through winter? Winter is with us and the roads seem that much busier with traffic. There are fewer cyclists in the mornings going to work, and the care free, car free, long hot days of summer cycle chic seem a long way off. The winter coats are out, as is the sea of high-vis jackets which take to the streets of London when the days draw short. With the exception of the days when there's a Tube strike on and Bob Crow does his best to give cycling rates a boost, is it just me or do the streets seem strangely devoid of cyclists now that it is colder? Sure, there are still lots of commuting cyclists out and about, it just feels like there are fewer of us and that maybe some of our fair weather brothers have taken to other forms of transport instead. To be honest, when it's hammering with rain I don't blame them. I've never really understood the prevalent attitude amongst cyclists in the UK that you HAVE to cycle in all conditions, as if getting the bus when it's raining is somehow cheating. Personally I can't stand riding in heavy rain (I don't mind light showers) and find the perceived danger levels - and heart rate - go up ten fold when it's pouring down, the streets are slick with water and every driver seems to be peering through a tiny patch of wiped down misty window. Maybe the "do or die" attitude some of my riding friends have stems from the general marketing of cycling as a source of pain and hard work - the image of which is so prevalent in the UK and which I think leads directly to why people buy lots of cycling 'safety' gear and why some people give up riding in winter altogether. They are led to believe that cycling is dangerous anyway, and the addition of cold dark journeys makes it a perceived risk too high to take. 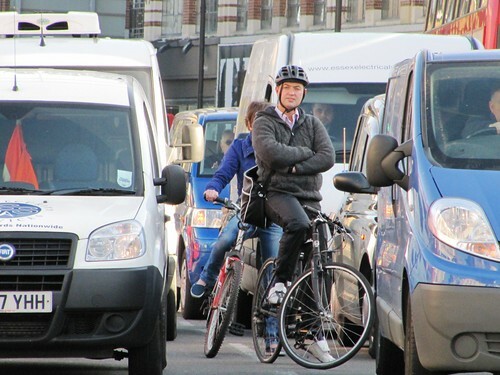 I've touched on the public face of cycling, and cycling's PR problem in greater depth before, but it's when the winter months come round that the gap between what I'd like to see achieved on the roads in terms of everyday and ordinary cycling and the reality of the situation seems most apparent. But you know what? I don't mind riding in the cold, in fact I love cycling during the winter months. I was out on two wheels when the snow was falling last January and was at my desk hours before my beleaguered colleagues who battled their way to work on our creaking transport system. With a good set of lights, a decent warm jacket (none of this "clothing for cyclists" malarkey either, I got a great new coat on Oxford Street on Saturday which is smart, practical and essentially four jackets in one! ), some rather fetching woolen gloves and a scarf to match, I find cycling in winter a more pleasurable experience than slogging through the sticky streets in high summer. I've oiled my hub gears, cleaned my chain and pumped up my puncture-proof tyres. 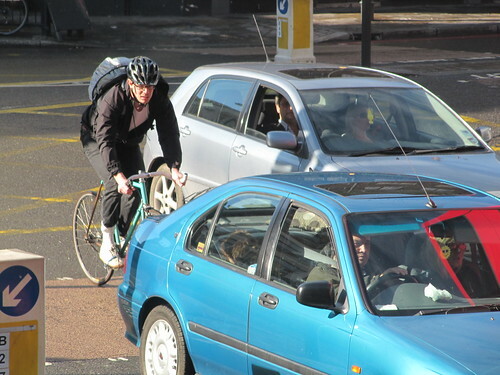 Anyone can ride a bike and it needn't be a perfect summer's day outside to do so. And being able to eat copious amounts of Christmas cake with immunity just from riding gently to work and back every day is of course a great boost (or as my rowing team always say "Winter miles mean summer smiles!") I'm ready for the winter, who is with me?! Did you know i b i ke l o n d o n now has a Facebook page? It's easier than ever before to keep up with the latest cycling news and views from your favourite bike blog. Just click the 'Like' button over here. I don't ride in ice - there are few better ways to get a broken elbow, in my experience. (Well, don't ride means not doing the full commute, I ride a Brompton to the train & go all the way to town rather than part way). I'd rather cycle in the rain than trudge to a tube station and then sit on a train steaming gently while being dripped on by other commuters and poked in the eye with umbrellas. I've cycled in the rain here in Brisbane, Australia during the wet season (we only have two seasons - wet & dry!). The downpour was very heavy indeed (ie. Monsoonal) but it didn't bother me at all... as it was on a separated cycle path. There was no threat of debris, oil, glass or unruly drivers. I put everything important into waterproof panniers and just live the moment. It's fabulous and you feel so alive. I wouldn't have done it on a road with motorised traffic. In the 'cold' part of the year I start my journey in the dark and it's about 5 degrees C - not that cold in reality I know! I wear leather gloves, a nice jacket and a beanie. No high-vis nonsense in sight (nor helmet - illegal here, I know) and I've not had a problem. The funny thing about fluorescent colours is that they require incident UV light for them to 'fluoresce' - ie. sunlight. If there is no UV they just look dull (ie. in car lights, street lights, etc). I focus on riding safely and carefully (lights in the dark) and I've not fallen since I was a child. Reflective products have a similar problem. Unless the 'eyes' looking at you are close to a light source, the reflection doesn't bounce back. I'm also not brave enough to cycle in the snow or ice, but give me a frosty cold, clear, sunny winter morning and I'm delighted to jump on my trusty bike and put some colour in my cheeks! There seems to be a bit of a trend seeting up here: cycling in the cold is fine, cycling in the wet is less appealing. In the cold, all you have to do is wear warmer normal clothes, and gloves, and perhaps a woolly hat. Pretty much like walking out to the sandwich bar at lunchtime. In fact, if like me you enjoy cycling to business meetings, cold is a positive advantage - you aren't in a muck-sweat when you arrive, and your hosts don't edge way from you at the conference table. Wet, I guess, is a little more risky due to skid risk, but the real issues are dirty road spray, wet hair, and the need to wear something more protective. I cycle my Brompton the short distance from Waterloo to my office all year round, and when it is wet I don a normal (low-viz) waterproof coat (Gant) and a pair of waterproof trousers from Rohan. I manage still to look almost normal. At the office a quick change into suit trousers in the gents'. It is however clear that wet weather gets people off the streets. Last week our office bike park, chocker all summer, was half empty. Thuis morning, crisp and dry, it felt like Critical Mass coming over Blackfriars Bridge! The one thing I love most about winter cycling here where I am in Canada, there seems to be fewer cars on the road...Or at least this is the impression I have of past winters. Biggest issue is with snow being cleared into bike lanes. Hopefully this year the bike lanes will be cleared. I prefer riding in the snow then the rain. At least with the snow I keep dry. @Ryan I'm hoping we won't be having snow so epic that it needs clearing this year (our winters are mild in comparison to yours!) but I did forget how riding on ice can be *ahem* interesting. When it was really icy last year so long as you took it slow I found riding wasn't too much of a problem, it was the skidding sliding cars you had to look out for! Thanks all for letting me know your thoughts on riding through winter - and glad to hear Blackfriars Bridge was busy this morning - let's hope this crisp dry weather holds out! It's a no brainer mate, since I've sold my car and wifey needs the family car for the kids, cycling is my only form of transport to and from work. I pedalled right through last winter anyway. As my old Sergeant Major used to bellow "There's no such thing as poor weather only the wrong kit!" My favourite cliche is "you only get wet once anyway!" Sod the weather, just pedal. Crumbs, Clive, that's dedication for you! I admire your staunch dedication. We've got no car either, but sadly the toasty excesses of the Central Line are just a few steps away when the going gets tough. Damn you, Transport for London, and your excessively good network coverage!!! I do ride in winter and prefer the cold crisp winter mornings to hot sweaty summer mornings. Fewer cyclists too on the towpath, although we are increasing in numbers gradually I've noticed in the last few years. A good and bad thing for me. Good for safety overall, but makes the canal less pleasant. For winter cycling I generally don't mind 2 out of the 3 negatives - cold/wind/rain. All 3 and I give myself a pass. Clive's sergeant major was right. If we can ski in snow we can cycle in rain. I decided last autumn that I was going to ride right through the winter. I did it, and to be honest it wasn't too bad; the only day I didn't was when there was sheet ice on the roads. Invest in a set of waterproof trousers and overshoes. The only thing that really hacks me off about riding in the winter is wet feet. Gloves are essential too, fortunately it tends to be warmer when it rains, so I'll often not wear them then, wet gloves are nasty. Finally, make sure you've got some decent mudguards. It'll protect you and your bike, and it's good for other cyclists too. I hate getting the dirty rooster tail off some else's rear wheel in my face. Of the three winter nasties (cold, rain, wind) rain is my least favourite, but with the right gear it's a minor inconvenience, rather than a total stopper on riding. Couldn't agree more. For many of us 'clothing for cyclists' is anything but 'malarkey.' I'd hate to have to get the tube for want of owning the right kit. There are plenty of companies out there that make cycle specific clothing that looks good on and off the bike. @VeLondon Thanks for stopping by. 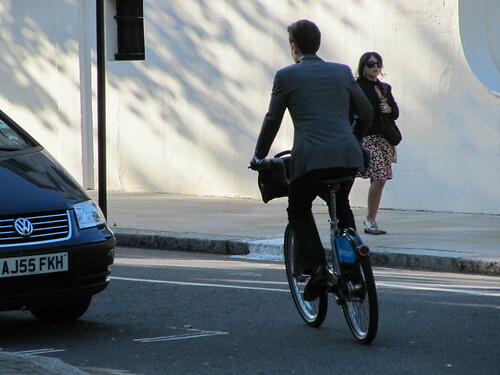 My point about clothing for cyclists wasn't to degenerate those who do choose to wear it (either out of choice or necessity 'cos of length of commute) merely to point out that you don't need it for short hops around town (my commute for example) which is the sort of everyday and ordinary cycling this blog focuses on. I choose not to ride in heavy rain not because my normal clothes (and some waterproof trousrs!) don't stand up to the job but because I don't like it. As for cycle-specific clothing that looks good on and off a bike, as the link in my blog post pointed out I've already got wardrobes full of my normal clothes that do the same thing. I love the blusher affect I get naturally on my cheeks as the cold air is met with the warmth as I 'workout' whilst leisurely cycling. 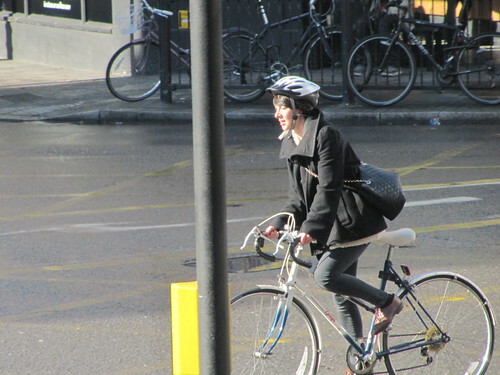 I love that you can look extra 'chic' whilst cycling in winter. Hats, scarves, gloves, earmuffs, knee high boots... yes it's all about the cosy fashion! No need for special cycling gear here! I love that I'm not freezing my bits off at a bus stop or sweltering in the disgusting, steamy and overheated tube carriage whilst being pelted from left to right with coughs and sniffels. And I love that early morning glow from the leafless trees and the sun peering through the clouds coating the streets in it's golden glory. Poetic, yes! So yes, I love cycling in winter! I love cycling whatever the weather, although I prefer it dry of course. @townmouse - if you ever find out about such invention let me know. Your new coat is FABULOUS! I'm prepared for the winter now...I think. Not much in the way of 'technical' clothing, just a hi viz waterproof for when it's pouring and visibility is low and also overshoes for when it gets really bad (but they are so ugly, I hate them). Otherwise it's just the normal; two layers of tights (usually nice and colourful), skirt/dress and lots of layers on top (which tend to come off one by one as I get warmer). Cycling in the snow last year was magical...pretty.